Wally is the original iPhone wallet reinvention: a slim, stick-on solution that achieved 753% of the goal on Kickstarter. 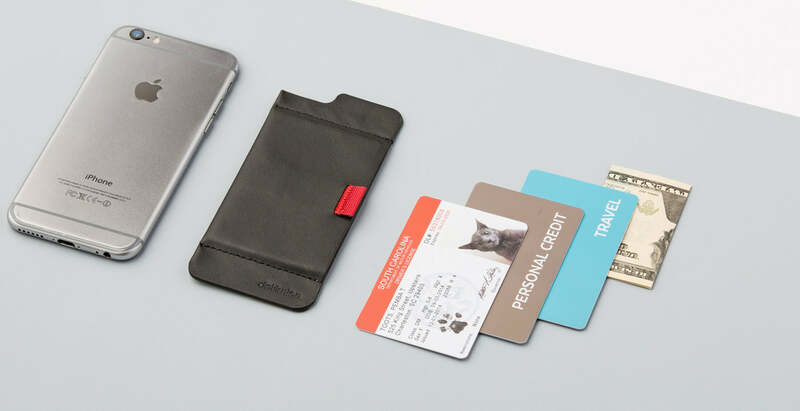 It’s the most minimal and discreet iPhone wallet you can imagine. And yep, it also works with cases. 3M™ Alternahesive is reusable without leaving behind residue. Recharge packs available. 6" tall x 2.8" wide x 0.1" thin (iPhone 6 Plus). NOTE: Wally Stick-On does not stick to the new iPhone 7 or 7 Plus. Returns will not be accepted if you decide to buy it just to try it – trust us. No refunds. With Wally no one will know you’re carrying cards conveniently on your phone. Our patent-pending design features Wally Pull-Tab™ for easy access to your hidden cards. Custom 3M™ Alternahesive™ was designed to stick directly onto your iPhone – and of course it's repositionable and removable without residue. It also works great on most cases, so you can add a secret card-holder to a case you already have and love. Talk on your phone, not your wallet. Wally’s different from every wallet case on the planet. First, he’s not a case. Second, there’s no sign of cards, so you’ll never look like you’re talking on your wallet. Over time, your leather will develop that handsome “this was my Dad’s wallet” feel and patina – without giving away that you’re carrying a wallet on your phone.